According to Eustat data, the results from Indicators for analysing demographic phenomena predict that a newborn male in our Autonomous Region will live over 80 years and have a 48% probability of getting married. If the newborn were female, her life expectancy would be prolonged to 86.3 years, her probability of marriage would be almost 52% and she would have only one child. In both cases, they would change their place of residence 9 times in their lifetime. 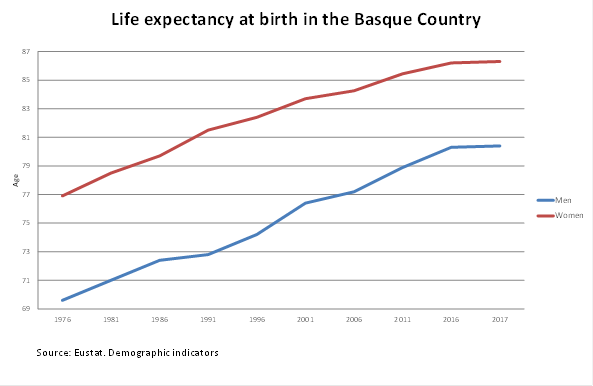 Both men and women in the Basque Country have experienced a constant increase in their life expectancy. Compared to the indicators observed 40 years ago (a life expectancy of 69.6 years for men and 76.9 years for women in 1976), life expectancy has increased by 9.4 years for women and 10.8 years for men. Men have gained 3.2 more months of life per year, reaching 80.4 years, while women enjoy 2.8 more months per year, reaching 86.3 years. The gap between the life expectancy of the two sexes has narrowed to 5.9 years, from a maximum of 8.7 years difference 25 years earlier. In any case, very few developed countries can take pride in having such high life expectancy, particularly for women. Tumours are the main threat to the years of life expectancy. If tumours were completely eliminated, men would prolong their lives 4.4 years and women 3 years. However, external causes of death are less detrimental, taking 8 months from the lives of men and 4 months from women. These figures drop to 1 month in the case of traffic accidents for both sexes. Fertility in the Basque Country was at exceptionally low levels compared to the fertility registered in countries such as France and Sweden, where it stands at 1.9 children per woman. In 2016, the average number of children was 1.3, a long way from the average of 2.7 children obtained in 1975 and the 2.1 required for generation replacement. The lowest index was in Bizkaia, with 1.3 children per woman, whereas Álava reached 1.5 and Gipuzkoa 1.4. On the basis of the data, it was predicted that women would have an average of 0.7 first children, assuming that almost a third of women would have none; 0.5 second children; and one in every ten women would give birth to a third or subsequent child. In this sense, the drop in fertility in the third child or more range was 90% compared to 1975. Another fertility characteristic of Basque women was their high average maternity age, which stands at 32.8 years, more than 2 years above the European Union average. This is also 4.2 years higher than it was in 1975. The average maternity age was lower in Álava, 32.4 years, than in the other two provinces, given that in Bizkaia it stood at 33 years and in Gipuzkoa it equalled the Basque Country average. The percentage of first marriages according to the rates for 2016 stood at 47.7% for men and 51.9% for women, meaning a large drop compared to 2001 rates, which were 56.1% and 59.5% respectively. From the other point of view, these data meant that 52% of men and slightly less than half of women remained single. That was far from the situation 40 years earlier, when practically everyone got married. An analysis of the marriage rate showed that the age for marriage continued to increase. The average age for the first marriage was 37.1 years for men (10.4 years later than in 1975) and 35 years for women (10.8 years later than in 1975). As in the case of the fertility rate, a considerable number of marriages took place at specific ages. In just 6 years, between the ages of 29 and 35, 46.4% of men and 48.6% of women got married. Normally, emigration is intra-provincial. In other words, the municipality of destination is in the same province as the municipality of origin. Such is the case of more than half of the migrations (1.9 out of a total of 3.5 for men and out of a total of 3.4 for women). However, on average men migrated 1.3 times to destinations outside of the Basque Country (40% of the total number of emigrations), a figure close to the average of 1.4 emigrations for women (38%). Migrations between provinces barely accounted for 9% of the total. By province there was quite a pronounced difference between Bizkaia and Gipuzkoa, on the one hand, and Álava on the other: Álava had a rate of 2.7 emigrations for both sexes, Gipuzkoa had a total of 3.4 migrations and in Bizkaia it reached 3.7. These differences were due to intra-provincial mobility, because Gipuzkoa had 1.8 movements of this type and Bizkaia 2.2, whereas in Álava it scarcely reached 0.8. Álava stood out in terms of movements between provinces, with 0.4 per person, almost double those in Bizkaia (0.2) and Gipuzkoa (0.3). Amongst women, as the distance covered by emigrants’ increases, so does their average age. Thus, those who moved within each Province were the youngest, 33.9 years, and those who emigrated outside of the Basque Country did so with an average age of 34.5. For men, this variation is smaller and the opposite, going from 34.3 years for those who moved outside the Autonomous Community, to 34.6 for those who moved within the Provinces. With regards to transfers within the same municipality, the men and women of Álava show the highest mobility rate, with almost 7 movements on average, and those who live in Gipuzkoa the lowest. If the number of migrations are added to changes of address, residents of the Basque Country will change their place of residence 9.5 times during their lives, either within their municipality or outside of it.